Habit: Perennial herb [or not], unarmed, hairy, gland-dotted or not. Leaf: odd-1-pinnate; stipules obscure; leaflets opposite. Inflorescence: open raceme or dense spike, terminal. 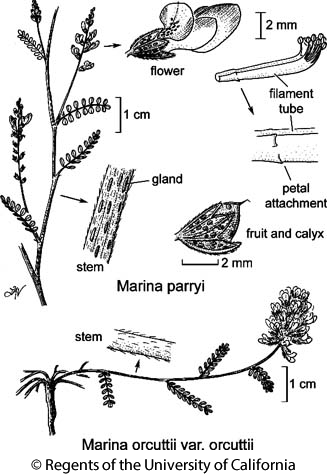 Flower: calyx lobes < tube; corolla generally 2-colored (blue-violet, white), petals (except banner) from side of filament column; stamens 9--10, filaments fused; ovule 1. Fruit: indehiscent, included or +- exserted. Seed: 1. Habit: Plant 2--8 dm, strigose. Leaf: well spaced; leaflets 11--23, 0.5--6 mm, oblong obovate to +- round, flat, +- gland-dotted. Inflorescence: 2--10 cm. Flower: keel 5--7 mm. Chromosomes: 2n=20. Citation for this treatment: Michelle M. McMahon & Duane Isely 2012, Marina parryi, in Jepson Flora Project (eds.) Jepson eFlora, http://ucjeps.berkeley.edu/eflora/eflora_display.php?tid=32772, accessed on April 23, 2019.